Much like in their first preseason triumph, Buffalo’s second and third stringers controlled the games as the Bills rolled to a 20-16 victory over Minnesota at home on Friday. It was a victory marred with regret as EJ Manuel was forced to go through a minor procedure on his left knee, knocking the rookie out for at least two weeks. Manuel didn’t show any signs of injury during his time against the Vikings, putting together another nice outing and taking another step towards Buffalo’s starting job. Manuel’s play, like against the Colts, was less about the tangible results and more about his presence on the field, for me. Racking up yards against second and third teamers doesn’t hold as much water for me as the operating efficiency that Manuel has shown on his two long touchdown drives. He appears to have a strong grasp of the offense and manages the game well. Obviously a 225 yard, two touchdown half would yield numbers that indicate Manuel’s play was beyond impressive; but in these shorter cameo’s the substance is less about the final stat line for me. Kevin Kolb’s numbers serve as a good example of this. He finished the evening with a couple of quality drives which bolstered his box score a bit. However, his play within the first half left plenty to be desired. Manuel’s knee injury will keep Kolb afloat for now, but it seems like a safe bet that the rookie will lock down the top spot on the depth chart. The only concern surrounding Manuel’s knee is what his condition will be once he’s recovered. The prognosis was two-to-four weeks with the two week estimate putting him in line to start the home opener. However, will Manuel still be hobbled in that game? Will he be hobbled the rest of the year if he’s rushed back? While it appears that the injury is indeed miniscule, Manuel’s place in the big picture of the 2013 season should be taken into account. Friday was also another impressive body of work from the Bills defensive unit. Not only did the backups hold the fort, the starters stole the show this time. Mike Pettine dialed up consistent pressure and Buffalo’s linemen had no trouble getting penetration and creating pressure for the entire night. In addition, I thought the starters fared very well against the run – a major weakness these last few years. 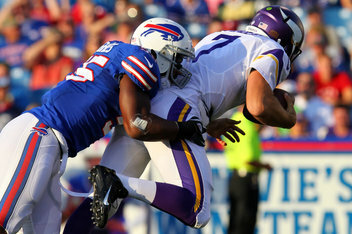 Jerry Hughes’ pair of sacks put him in the spotlight, but the real stars were in the trenches. Marcell Dareus does indeed to appear to be enjoying a nice upswing thus far and Alex Carrington has translated his success on the practice field to games. Alan Branch saw a ton of time and it appears that he and Jay Ross locked up their spots as reserve linemen heading into the year. I’d expect to see plenty more of that pair in the coming weeks as Kyle Williams continues to work his way back to 100%. Depending on health, Buffalo’s down linemen could serve as an impressive unit this season. Friday’s game also brought about a close to the kicking competition. Dustin Hopkins again got the first kicks of the night – something I had expected to change with each game – and has done enough to earn the job. I’d venture a guess that Hopkins ability to get touchbacks compared to the kick that went for a touchdown on Lindell tipped the scales for the last time. While the touchdown came back, Lindell’s inability to prevent returns was all the coaching staff needed to see. Consistency will now be the key for Buffalo’s two young specialists. Shawn Powell hasn’t fully dialed himself in and it is vitally important that Hopkins do so in the Ralph’s funny winds. The signing of Jamaal Westerman was an interesting choice as it reunited another linebacker with defensive coordinator with Mike Pettine. However, I wonder if he’s a longshot for the roster based on the play by those ahead of him. Obviously Mario Williams (DE/LB), Jerry Hughes, Manny Lawson, Nigel Bradham and Kiko Alonso make the team. Jamie Blatnick had another strong outing to further reinforce his chances at a roster spot and Marcus Dowtin’s ability to play inside and outside make him a valuable commodity. Chris White and Arthur Moats are solid enough depth players and special teams aces that they’ll likely be suiting up on Sundays as well. Marcus Easley is doing his best to force the Bills to keep him. One year after a kickoff return touchdown helped the kid stick around; he’s racking up catches and yards like it’s going out of style this season. Easley has the speed to contribute on special team and he’s also proving to be a quality target offensively. If there’s any direct threat to the multipurpose Smith, I’d say it’s Easley. On the other side of the battle for the final two spots, I’d say that Chris Hogan has locked things up and Da’Rick Rogers has punched his ticket out of town. Hogan has lived up to his nickname while Rogers has found his way to the doghouse and out of any meaningful reps. The Bills appear to have a penalty issue cooking through their first two games. They were on their way to 20 infractions on Friday before getting saved by the final whistle. Doug Marrone did wonders at Syracuse with a strong disciplinary attitude and I suspect that he’s working on building that same culture here. It just seems to be taking a little while to kick in. I ran out of fingers and toes to count on seeing fans walking back to their cars to return bags or purses that don’t fall in line with the NFL’s new policies. For a sport that has become more about the in-home viewing and ever more valuable TV dollar, the fan experience in the stadium appears to be something the league care little to dictate – especially ones that upset the masses. I don’t think there’s a breaking point when it comes to the NFL, but I’d be interested to see what they try to push on fans next. – EJ Manuel’s absence will be disappointing for fans but letting Kevin Kolb shake off his rust will be more valuable than the boo birds may realize. Even if Manuel is healthy for week one, the need for Kolb could be there when the Pats come to town. – As the primary dress rehearsal for the regular season, I’m interested to see how much time CJ Spiller, Mario Williams, Stevie Johnson (if healthy) and other studs get against the Redskins. With the Manuel injury fresh in everyone’s mind, it will be interested to see how things shake out. – It’s clear that Leodis McKelvin needs to get healthy. Buffalo’s depth at corner is woeful and I’m quite surprised that they haven’t explored any free agent options to this point. – Some of the bubble battles waging on Buffalo’s roster may ultimately go to the veterans after some early camp opinions indicated talent in Buffalo’s youth. For example, Kendall Gaskins saw very limited reps on Friday and I just don’t think Zach Brown can unseat Tashard Choice as the team’s third running back. – With roster moves coming in at a fairly steady stream now (Rian Lindell joined four other cuts from this weekend) I’m interested to see if the Bills wait until the 27th or know what direction they’re going on Sunday or Monday.